As a non-animal-based source of protein, nuts are incredibly popular among both vegans and vegetarians alike. Rich with essential nutrients, however, nuts are a food that everyone should be getting plenty of. Following are three, amazing benefits of adding nuts to your diet by tossing them into your prepared meals, and by munching on them for snacks. When it comes to protecting the heart, many people make the unfortunate mistake of limiting or outright avoiding all types of fat. Fat, however, is actually essential for overall health. As such, rather than cutting fats entirely, you should instead seek out the right types. Nuts are rich with both monounsaturated and polyunsaturated fats that help lower levels of low-density lipoprotein or LDL cholesterol. They’re also rich in fiber, Vitamin E, and omega-3 fatty acids that naturally prevent palpitations and other dangerous heart rhythms, while additionally reducing plaque build-ups in the arteries. One of the most successful strategies for promoting long-term weight loss is to load up on fiber. Snacking on almonds, pecans, and walnuts can help people feel fuller for far longer than if snacking on simple carbohydrates that are quickly converted into sugar. Nuts are also the perfect snack for getting a decent boost of energy, without having to deal with a quickly ensuing crash. 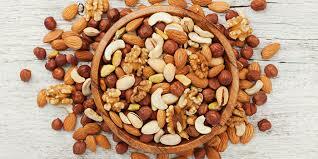 Best of all, true nuts are not known to create any significant rise in blood sugar levels following consumption. This makes them preferable to cookies, donuts, granola bars, and many other convenience foods that people often reach for when feeling a bit peckish. If you’ve just started a new weight loss plan, stocking up on wholesale nuts can be a very easy and inexpensive way to stave off compulsive and unhealthy eating, given that you’ll always have a satisfying and high-energy food right at hand. Oxidative stress is the cause of aging and ongoing wear and tear on the body that eventually leads to declining health and disease. As a nutrient-dense food, nuts are incredibly high in antioxidants that help reduce this stress. This is especially true of pecans and walnuts. Regular consumption of walnuts and pecans has actually been associated with a significantly reduced risk of both cancer and obesity. It’s also important to note that nuts are a very easy, dietary addition in this respect. By packing a small container of nuts each morning, you can munch on a wholesome and tasty snack throughout the day to keep your skin, hair, and nails looking youthful and healthy, and to assist your body in keeping itself disease-free.